India, with its myriad lentils, spices, curries and a variety of gluten free grains, is a haven for a celiac patient or anyone consuming gluten free food. The awareness about celiac disease and gluten free food is, however, minimal presently amongst the masses and even the food industry. The concept of food allergy itself is relatively new and not well established as yet. Gluten and allergen labeling on food products has also not been defined under food laws. You will, therefore, not find information regarding gluten on mainstream packaged products. Most of the international food brands are present in the country but unlike their allergen labeling practices in other countries, you will not find them declaring the same information here. Understanding which packaged food product is safe to consume, does therefore, present a challenge. However, the reliance on packaged food is not very high here and a variety of dishes are prepared using natural ingredients like lentils, vegetables, rice, meat, eggs, spices, fruits, nuts, seeds etc. In fact, a unique advantage that our country offers is that each region of the country has its own regional cuisine which will have plenty of dishes – from starters to desserts – which are inherently gluten free and made from natural gluten free ingredients. The chefs at some select fine dining restaurants are aware of the diet and at some of the popular tourist destinations in the country you will find restaurant staff familiar with the words ‘gluten free’. But the knowledge of finer nuances like cross – contamination and hidden sources of gluten are still largely missing, at times even in the top end hotels. This needs to be communicated clearly. Use our Dining Out tips and Dining Card (The dining card has information in English as well as Hindi) to help you order and enjoy a safe gluten free meal in any part of the country. Discuss it with the chef who would be able to recommend you many dishes based on this. Select supermarkets in the big cities now stock few gluten free products like pasta, cereal, bread and cookies by some leading international companies. These may not be available at all times and it is advisable that you carry your own breakfast cereal or pasta (or any other special ingredient) which you could ask the chef to prepare for you. 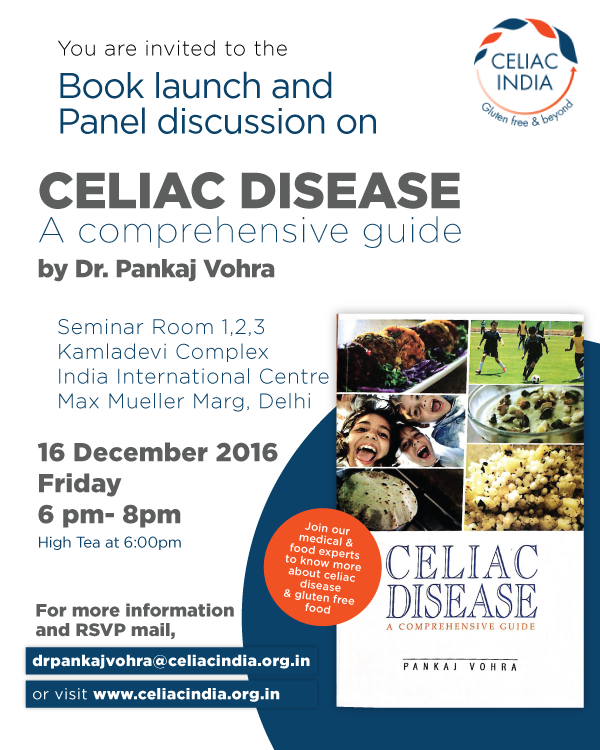 The incidence of celiac disease is on a rise in North India in the past few years and with it the scenario is slowly changing. Awareness about this condition and gluten free diet is slowly percolating to more dining establishments and some sectors in the food industry too. We hope in few years we will have more information from the packaged food industry. Till then, visit the ‘Celiac friendly’ provider listing on our website to read about restaurants and resorts which are celiac aware and ready to welcome gluten free guests. With many inherently gluten free food items in our country and a society where guests have always been given a special place, you would never be short of variety for gluten free friendly food options in India! Do write to us at glutenfree@celiacindia.org.in for any assistance or query and we would be happy to help you.